Poster Collection, INT 493, Hoover Institution Archives. Where is Stanley Kubrick when you need him? With Donald Trump withdrawing from the Joint Comprehensive Plan of Action (aka “the Iran deal”), playing summit footsie with Kim Jong Un and scoping out a vigorous modernization of the aging U.S. nuclear force, the abyssopelagic layer of the Deep State has taken on new life with warnings of the approaching apocalypse. The Bulletin of the Atomic Scientists has reset its “Doomsday Clock” to two minutes to midnight. “To call the world nuclear situation dire is to understate the danger—and its immediacy,” intones Rachel Bronson, the journal’s president and CEO. Writing in Foreign Affairs, Adam Mount of the Federation of American Scientists argues that, by planning to refine American nuclear posture, the Trump Administration is making things worse, “usher[ing] in a future in which nuclear competition is commonplace.” And, in a long New Yorker article that includes a potted history of World War II strategic bombing and the Cold War arms race, “investigative” reporter Eric Schlosser—probably best known for his 2001 book Fast Food Nation—goes full Strangelove, minus the irony. Schlosser concludes his essay with a fawning section on the Nobel-prize-winning Campaign to Abolish Nuclear Weapons, arguing that “stigmatizing” such systems and buttressing nonproliferation agreements are the necessary responses to the dire dangers he describes. To be fair, there is reason for alarm. There’s been an uptick in nuclear proliferation over the last decade, and it’s not just North Korea and Iran. Perhaps most worrying is Pakistan, which actually has the world’s fastest-growing nuclear arsenal; as India has modernized its land forces and begun to theorize about blitzkrieg-style campaigns, Islamabad has responded by introducing low-yield tactical nuclear warheads atop short-range delivery systems. The Pakistani army has taken a page from Eisenhower-era U.S. and NATO doctrine. China, too, appears to be moving from a narrow deterrence posture to a more flexible and potentially coercive one, adding nuclear versions of its truck-mounted Dongfeng-41 missiles. And, despite the overall shrinkage in Russian nuclear forces, Moscow has continued to modernize and likewise maintain its advantages in short-range systems. These are not stabilizing trends. Yet to step back from these headline developments and consider the larger pattern of the post-Cold-War period, the story of nuclear proliferation is equally one where the dog hasn’t barked. The U.S. conventional-force supremacy first displayed in Operation Desert Storm was supposed to start a scramble on the part of rogue regimes to field even a modest nuclear capability in order to deter the Americans and the “neocon” enthusiasm for “regime change.” Long before National Security Adviser John Bolton’s “Libya model” came the “lesson of Saddam Hussein”—if Saddam had only waited until he had a nuke, he’d still be around today. Even the cases of North Korea and Iran, if considered closely, don’t necessarily confirm the deter-America analysis. Pyongyang was willing to ditch its original plutonium program in the 1994 Agreed Framework, while patiently developing the smaller hydrogen weapons of its current program. It would seem that the Kim regime has more in mind than simply securing its own survival, and maintains its long-term—and publicly proclaimed—goal of reunification of the peninsula on Pyongyang’s terms. Similarly, in the Iran deal, the Obama Administration offered Tehran a bargain it couldn’t refuse: a green-light—and good financing—to pursue its goal of regional supremacy. For both the North Koreans and the Iranians, nuclear weapons were means to a greater, more expansive end than deterring the United States. As American power has receded, it’s not just eased the pressure on autocratic regimes, it’s given them what they regard as opportunities. Through this period, America’s allies and less formal strategic partners have likewise been rather quiet canines. With China’s rise and increasing military assertiveness, Japan, South Korea, and Taiwan—all states with plenty of money and technological savvy—have had good reason to create deterrent nuclear forces. Likewise, Saudi Arabia has had both means and motive. Until now, they have been content to remain under an American umbrella. But the fabric of that shield is shabby, and therein lies the greatest danger of accelerated proliferation. The Trump Administration’s nuclear review is in fact a very mainstream document, an extension of the Bush-era posture plans. Many of the authors are the same; no Buck Turgidson among them. 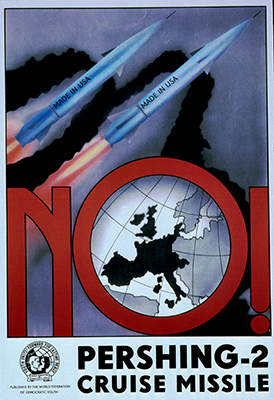 By contrast to the arms-control illuminati, the Defense Department begins its discussion of nuclear strategy and forces with a reminder of U.S national security interests and an analysis of international politics and power; it advances “tailored strategies” for China, Russia, Iran, and North Korea as well as “hedging” against other “uncertainties,” and makes “assurance” of allies an equal priority with deterring adversaries. It responds to practical realities rather than abstract possibilities. Nuclear strategy is an inherently paradoxical thing; the weapons achieve their purpose when they are not used. The irony of the current moment is that it requires more and better U.S. nuclear systems to avoid the looming doomsday. That measures the difference between a peace prize and peace itself.